We really liked The Commons at Elk Grove and it's what my mother is most interested in. We were very impressed with the people and the place. The room was fine, and the person during the tour was wonderful. We went to the dining room and we saw people playing Bridge, we talked to some of the residents, we saw the activities they have to offer, the movie room, the gym, the outside, and the popcorn. There was a lot going on, and we were very satisfied. The food menu was good. My husband moved into the Commons at Elk Grove, and I can't say enough good things about it. It's wonderful. The people are very kind, very helpful, and the food is excellent. It's run beautifully with plenty of activities. They have bus trips out in the area, picnics, and a barbecue the day before Father's Day, where family can come. The manager is very kind, and he took us to a medical appointment yesterday. They have a bistro where they can go at any time during the day for popcorn, fruit, and water. They have an exercise room, a computer room, library, theater, and activity planned every day. I think they do a great job. The Commons at Elk Grove was very nice, but it was very small, and it felt a bit tight. The grounds were very small. My aunt wants a bigger, dedicated kitchen, but unfortunately, they don't have those. They just have kitchenettes. Other than that, it was very nice. The staff was great. We saw people participating in ongoing activities when we were walking through. We also saw areas where people were congregating and playing board games. This community is licensed for 71 assisted living and 24 Memory Care residents and privately owned/managed by WestLiving who manages seven other communities in California, Washington and Arizona. This Elk Grove location is conveniently located right off of Elk Grove Blvd. and is a lovely facility with beautiful interior decor. The fees for care are a la carte so you pay for the services that you need. The point system for calculating the care fees is not easily understood, so be sure to get the fees itemized. There is a wide variety of choices for food but the food taste is mediocre. The room sizes are small with a one bedroom apartment at 469 sq ft. The best way to get to know a community is by scheduling a tour. See the facilities, meet the staff and residents, and get a feel first hand what it's like to live at The Commons at Elk Grove Assisted Living. Centrally located in Elk Grove, California , The Commons at Elk Grove is dedicated to offering a true sense of belonging to seniors and their families. It's a feeling you'll notice the moment you're invited to "make yourself at home" and continues through every thoughtful, personal detail. 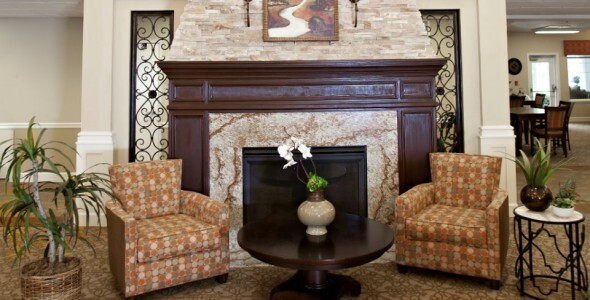 With numerous sitting areas throughout our stylishly decorated common rooms, those with mobility difficulties will always have a place to rest at The Commons at Elk Grove. Apartments include both private cozy studios and spacious one- and two-bedroom apartment homes. Each is well-designed to enable mobility, with plentiful safety features. Depending on your floor plan choice apartments may include kitchens or kitchenettes, private bathrooms, in-unit washer and dryer and a balcony or patio. Dining at The Commons at Elk Grove features table service with a choice of entrees, prepared by our expertly trained culinary staff. Additionally, our staff organizes a variety of individual, social and wellness activities to suite the interests of residents including musical aerobics and Ceramics at Westside Center. At The Commons at Elk Grove compassionate staff assumes the chores and burdens of home maintenance and housekeeping. We are focused on providing wellness solutions to our residents so they can thriveand live a full life throughout their retirement. We have caregivers on-site around-the-clock to support resident needs with activities of daily living including mobility, grooming, bathing and more. For those who suffer from dementia will continue to receive care as they age in place through our memory care program. Our highly trained professionals provide direction and guidance to those who need extra support, utilizing best practices and standards based upon the latest research. Whether there is a need for cueing or simple friendship and companionship to relieve the anxiety associated with cognitive loss, we are there for your loved one. We welcome you to visit us at The Commons at Elk Grove, where we pride ourselves on ensuring the highest quality of care and service.